I hope you’ve been enjoying my Q&A features over the past week with Dads Who Rock. It’s been fun to hear everyone’s experience and point of view and how they integrate music into their families lives, as well as how they find a balance between musical and parental lifestyles. Today’s feature is the first of several I will be publishing to close out the holiday. Jon Babu, along with his wife, Kelly Donohue, are in the DC-based kindie band, Here Comes Trouble. Kelly’s soulful voice leads the group while Jon’s drumming keeps up a wicked beat to give the band their punchy sound. 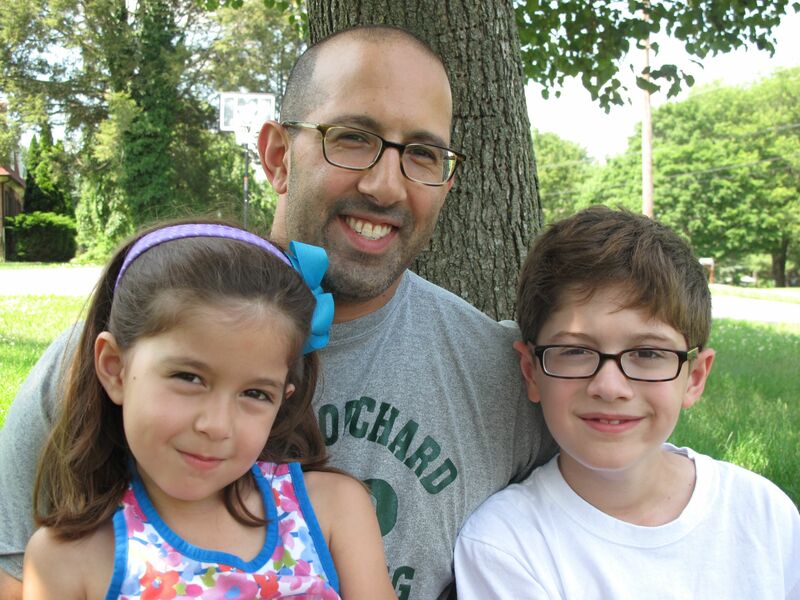 Jon is an outstanding jazz drummer, in addition to being a tax attorney and a kids’ musician. He was trained at New England Conservatory of Music (both he and his wife, Kelly, received double undergraduate degrees in English from Tufts University and in Jazz Performance from NEC). They worked and studied with such jazz greats as Ran Blake, Dominique Eade and Bob Moses. Babu has extensive experience with the sticks and has performed and recorded with a number of bands, toured Germany with a jazz trio and headlined with the hip hop group Red Time, gaining a diverse palette of experience that filters into the jazzy/funky/punk inspired sounds of Here Comes Trouble. Together Jon and Kelly have two kids: 10-year-old Jack and 6-year-old Nora. In addition to being a kids’ musician, Jon also leads a double life as a tax attorney at an accounting firm in Bethesda, MD. 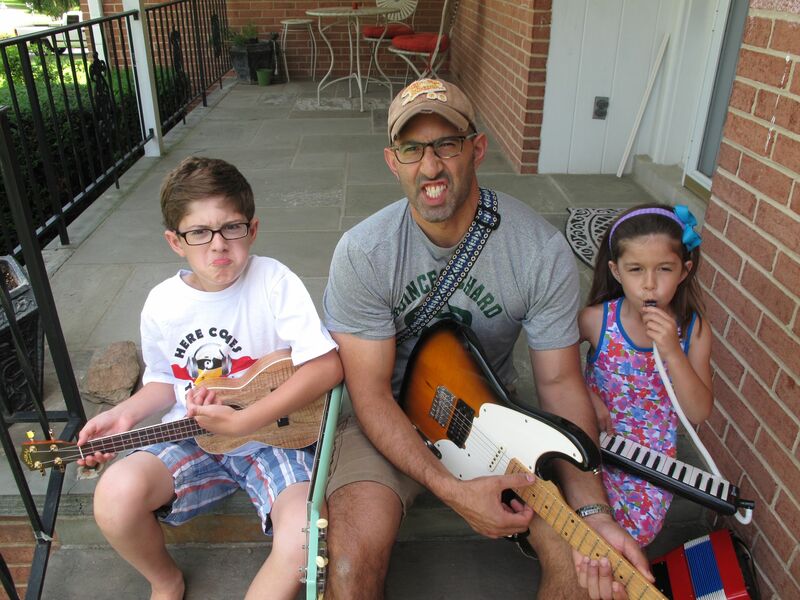 It was when their son Jack was about 5-years-old that Jon and Kelly realized that their kids knew nothing of their parents’ musical background. After a disappointing search for quality children’s entertainment for Jack’s fifth birthday party, they decided to do something about it and formed Here Comes Trouble in 2010. Together with some musician friends, they wrote and rehearsed a full set of original songs just in time for their Jack’s party, and Here Comes Trouble was off and running from that point onward. Here Comes Trouble’s debut album, Goo On My Shoe, was recently released and is available for download and purchase through their official site. Keep up with the band through their Facebook page. Below Jon offers some Father’s Day insight, as well as episode one of a drumming essentials tutorial recorded in honor of keeping Jack, as well as other young drummers inspired to keep up with their craft. Jon’s expert advice starts with one of the most iconic skills, stick twirling, followed by a demonstration of him crushing it on his own kit with the kids jumpin’ on a trampoline behind him. Another iconic picture…of work/life balance! JB: I’ve always wanted to be a dad – long before I considered being a musician. It is the most important thing I do in this world. JB: I think I have the best kids in the world, and I know them in a way that no one else can (it is not always easy – ask me another time and my answer may be different!). They’re really fun, cool people and I get to see them at their best and their worst, and I love having the relationship with them that I do. JB: When I got out of college I was ready to move to New York, sleep in someone’s closet, and play as much music as possible until I could do it as a career. Now, the idea of committing that much time to performing doesn’t seem realistic, in my opinion. I do miss performing, especially at a higher level than I can reach these days. I know people maintain touring schedules and parenting duties, but for me I don’t know how I could do that with young kids (…unless they were out there with me – maybe I need to work on that plan!). On the other hand, whenever I get a chance to play music with people these days, whether it’s with my wife and our band (Here Comes Trouble), or some of the other folks I play with, I have the BEST time. I appreciate every chance I have to get out and play with people, now that I don’t do it as often as I used to. JB: We went snow tubing this winter. Before we got there, both kids were whining and complaining about going – probably because it was my wife’s idea and they never want to admit she has any good ideas. By the time we left the mountain, we had to drag the kids back to the car because they had so much fun. They were both asleep before we’d even gotten on the highway to come home. I love those kinds of days – when no one is in a good mood and then everyone turns it around and has a great time. That was a really fun day. JB: Both kids go in and out of phases with music. Our son has been playing saxophone and we’ve been trying to think of ways to get him in on some of our songs with Here Comes Trouble. But now he’s talking about giving it up and trying something else. Both kids have good voices, so they sang on our last CD. The video I sent is in part my attempt to get them interested in the drums, since we have drums and cymbals lying all over our house and it would be great if they would use them! I remember taking guitar lessons when I was 7, and within a month I lost interest because it wasn’t fun. So this video is meant to try to get our kids and other kids to pick up some drumsticks and do something fun with them, rather than focusing immediately on rudiments and sight reading. That stuff is important, but we need to learn about showmanship and have some fun too! Hey Kelly! YAY! You’re welcome :). I’m so glad you liked the feature and was happy to post! Please also thank Jon for me and tell him I said Happy Birthday! Hope you guys had a great weekend! We are really digging your tunes, thank you for bringing some great music into the kindiesphere.